A few weeks ago there emerged a new conspiracy theory about the Russians have funded a massive pro-Leave social media campaign. I part-prepared a post backing one at Cliscep emphasizing how ridiculous the so-called evidence was for these claims. Last week Facebook announced that the Russian Internet Research Agency had spent a grand total of $1 (73p) on six adverts and Twitter revealed that a total of $1,031.99 had been spent on six referendum-related ads during the campaign. The circumstantial evidence that social media was likely to have had a bigger influence on the Remain vote than on the Leave vote. The evidence for the success of the Russians on Twitter in influencing the Brexit result needs to be viewed in the wider context. First is to check the data in support of the argument. As Geoff Chambers pointed out @ 15 Nov 17 at 1:51 pm, the 11 billion estimated views of the 135,597 automated tweets from June 20-24 seems somewhat high. 500 views per person in the UK, is likely far more than the average Twitter account holder in a five day period. Second is to look at the other tweets. The bot accounts were not the only source of tweets supporting Brexit. Further, there were quite a lot of tweets in the support of Remain. Third, is that there are other sources of news/information/propaganda in support of both sides in the campaign. What about the official campaigns? Or the support of international political leaders or International Organisations (e.g. IMF, EU) or businesses? Would a majority of the British public really prefer the opinions of a Twitter Bot over those of President Barak Obama, Chancellor Angela Merkel, Prime Minister David Cameron, the British Treasury, celebrities like St. Bob Geldof, the majority of British MP’s or most British businesses? Which side of the EU Referendum did social media influence more? It is very difficult to tell the actual influence of social media on the vote, but there is strong circumstantial evidence that the influence will have been more towards increasing Remain vote rather than the Leave. First is from the age spread of the vote. I believe that Twitter and other social media use is inversely related to age. 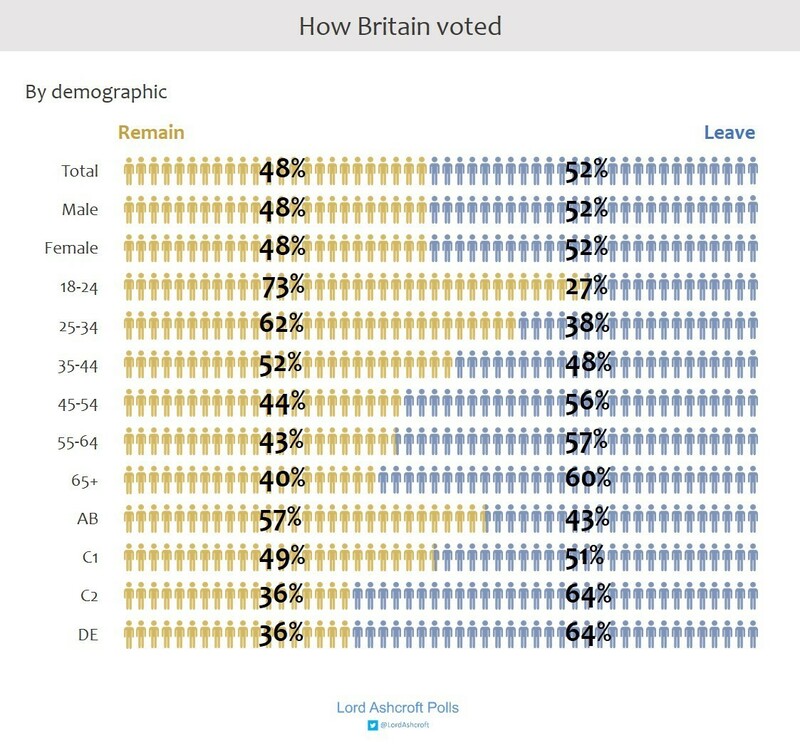 Therefore, one would expect that if there had been undue influence, the young would have voted more for Brexit than the older folks. Lord Ashcroft’s Polls surveyed 12,369 on EU Referendum day and published on 24th June under “How the United Kingdom voted on Thursday… and why“. 73% of 18-24 year olds and 62% of 25-34 year olds voted to remain in the EU. It would suggest that the Leave campaign as a whole failed to reach the Twitterati. From How the United Kingdom voted on Thursday… and why, is the following split by age band. Second I believe that due to its transitory nature, social media is more likely to have had a bigger influence on in those who made up their mind at the last moment, than those who voted as a reflection of long-held beliefs. But whilst 25% of Remain voters decided in the last week, just 22% of Leave voters did so. So either social media made a bigger influence on the Remain vote, or it had no significant difference at all. Third evidence that runs counter to a Russian influence through Twitter on the Brexit vote is in the geographical distribution of the Brexit vote. In England and Wales the constituencies that voted most strongly Remain were in inner cities, particularly London, Manchester and Liverpool. The strongest pro-Leave votes were widely spread. But the many of the extreme pro-Leave constituencies in the traditional Labour heartlands in the North of England and South Wales. I live in Manchester. This encapsulates the divide. 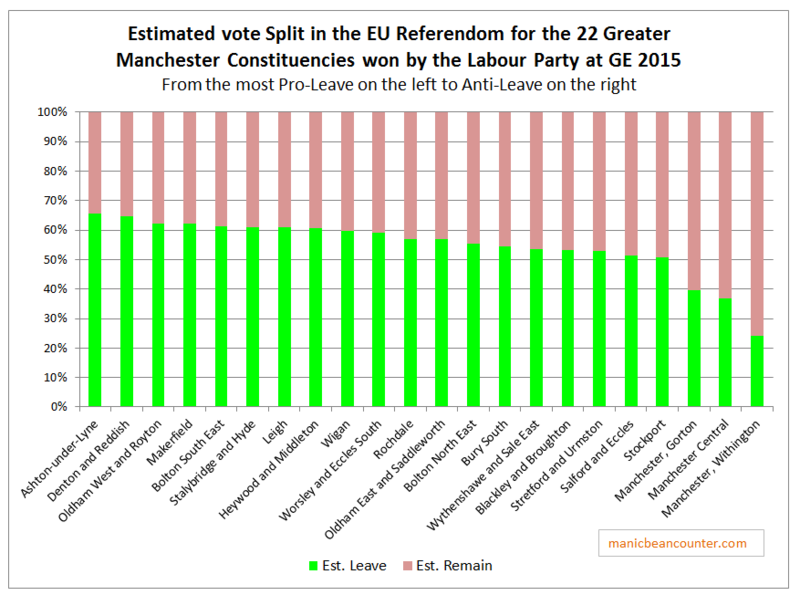 The City of Manchester has some of the most pro-Remain constituencies in the country, whilst much of the rest of Greater Manchester was pro-Leave. But as the City of Manchester folks has the most vocal people in the region, along with the most vocal twitterati, it would seem that Greater Manchester is full of Remainers. The estimated vote by constituency gives a quite different picture. The Leave constituencies are on the margins of Greater Manchester and form the big majority. But the most vocal opinion formers are in central Manchester. Similarly, the most vocal activists nationally are those in London, along with the University Cities of Oxford, Cambridge, and Bristol. Brighton and Manchester are also other centers of activism. Following the EU Referendum, there was a major online petition to Parliament that wanted to nullify the result by having a 2nd Referendum on different rules.The petition was dominated by those in London and other centers of activism. This was a petition map extract of 00.30 26/06/16. These same centres of activism dominated the “Prevent Donald Trump making a State Visit” petition at the beginning of this year. Compare the spread of petition numbers by political constituency with the rival petition supporting the state visit. The pale orange areas have proportionately very low numbers of signatories. The red areas have proportionately high numbers. The “Prevents” are mostly in the cities, the “Supports” have a much more even geographical spread. The claims that Russian-sponsored social media presence helping tip the scales towards a Brexit vote does not stand up to scrutiny. The actual evidence of spending on social media is negligible; the other forms of media and major leaders were predominantly pro-Remain; the demographics of social media users are very much in line with Remain voters; and online activists are dominated by City-based virulently pro-EU types. The continued Russian conspiracy theory is predominantly from a bunch losers who cannot recognize that most people have different views from their own.